"Better by far than anything currently on Broadway." That's what John Lahr, senior theater critic at The New Yorker magazine, and son of legendary actor Bert Lahr, has to say about Shlemiel the First. Shlemiel the First is an award-winning klezmer musical comedy based on a play of the same name by Isaac Bashevis Singer, about a holy fool sent on an ill-conceived errand that subsequently transforms the inhabitants of Chelm, his impoverished village. It features a live band, on-stage costume changes, and cross-dressing necessitated by the fact that many of the actors play multiple roles (some of the men even play their own wives). Here's John Lahr's review from the December 12 issue of "The New Yorker." All fans of the American musical who are sick of boulevard nihilism, movie retreads, choreographic cliché, dopey lyrics, and banal librettos, your ship has come in: “Shlemiel the First,” the terrific 1994 klezmer musical, adapted by Robert Brustein from Isaac Bashevis Singer’s, is being revived, Dec. 13-31, at the Skirball. David Gordon’s elegant production, set in the surreal shtetl landscape of Chelm, jolts an audience out of the habitual. Shlemiel, its eponyous beadle hero (Michael Iannucci), is a “crazy fool,” according to his wife (Amy Warren). He is called upon to spread the wisdom of Groman Ox, the wisest man of the village council of sages, who earned the laurel by solving a sour-cream shortage. The musical (with splendid lyric by Arnold Weinstein, and music by Hankus Netsky) is a wacky, inspired recounting of his hapless missionary journey. In its artfulness and eloquence, Shlemiel the First is better by far than anything currently on Broadway. It returns the musical to its playful, populist roots. Miss it at your peril. Shlemiel the First is now playing in Manhattan at NYU Skirball Center for the Performing Arts at Washington Square through December 31, the longest run of a single show for the 2011-12 Season. Shlemiel has been significantly reworked since it was originally co-produced by the American Repertory Theater in 1994. This current production comes courtesy of a collaboration between NYU Skirball, The National Yiddish Theatre-Folksbiene, Theatre for a New Audience, or TFANA and Peak Performances at Montclair. 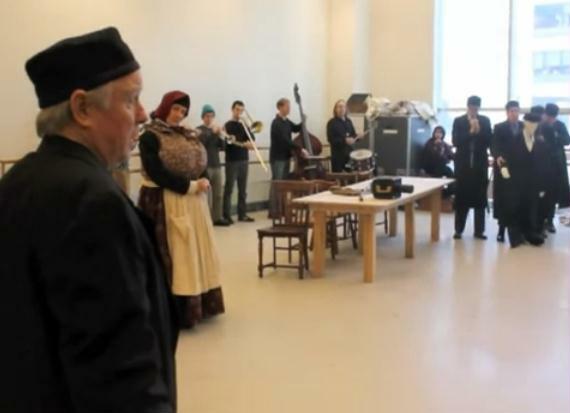 During the last week of rehearsals at The New 42nd Street Studios, a video was made of the Shlemiel cast and crew. In it, they describe their specific roles within the overall production. The individuals featured are (in order of appearance): Kristine Zbornik, Amy Warren, Jeff Brooks, Michael Iannucci, Aaron Netsky, Stephen Cain and Michael Larsen. So watch the video and get tickets while they're still available. We'll be attending the December 26 performance. Enjoy! This musical sounds amazing! I hope that it will come to Chicago! My father (AH) was born in Chelm. Where will this be playing? Is there going to be a road company, too? Would love to see the whole geschichta unfold. Marie, it's good to know that once there was a real Chelm. Who is handling the licensing for productions, and do you know if it's available yet for licensing for an amateur production?